Just when I thought I had gotten over the rookie mistakes, I made one of the biggest ones of all. I got to camp in reasonable time, I had my wet towel for my neck and my bottles of frozen water and my binoculars and not one but two pens, since my pen the other day was getting a bit skippy. I got a seat which was not yet in the shade but soon would be, sat on my cushion (because those bleachers are a challenge even for my well-padded avoirdupois) and settled in to start writing. The only problem was, I had nothing to write upon. Nothing. I had forgotten to put my legal pad back into the bag after taking it out to write up yesterday’s notes. I had nothing else, not even a few old receipts. Fortunately I remembered that St. Vincent’s hasn’t yet replaced the old-school paper towel dispensers in the women’s bathroom with air dryers, bless them. So I left my cushion there to save my place and rushed into the loo. I managed to extract six sheets (they are the sort that cut off at a certain length), and found a cardboard box in the cleaning cart from which I liberated a flap to write on, and I was back in business. Sort of, anyhow. When I returned to my seat some people had sat down next to it and left only the size of the cushion, a small one at that, at the end of the bleacher, which was a bit tight, but I made it work. Fortunately the Steelers seemed to have their heads in the game rather better than I did. The players were trickling onto the field about the same time I made it back to my seat, and Ben and Maurkice Pouncey continued their hit-the-crossbar-of-the-uprights competition. Pouncey was still losing, but he doesn’t give up. The usual pre-practice drills began with some catching drills. As I did yesterday, I’m going to combine some of the drills, since many of them are repeated, or at least very similar drills are run. The new TE, Jake Phillips, was targeted right away, and he caught it. These didn’t last long, as they went almost immediately to the kickoff catching drills. As has been the case so far, there was a cast of thousands lining up to catch these. The theory seems to be that if a guy is breathing and not critical for something else, send him out. Once again a plethora of large men—DEs, DTs, and so on—were lining up to take a stab at it. That was on the far side of the field. On the near side were some guys I think they had whittled down as the favorites, at least for the moment. Those would be Eli Rogers, Levi Norwood, Markus Wheaton, and Demarcus Ayers. I’m happy to say the latter looked just fine after he injured (or I suppose “tweaked” would be the word they would use) his ankle on Monday. But back to Steelers news. As I said, the JUGs machines were firing kicks, and the elite group was on the near side. However, they had an additional challenge—Ben Roethlisberger, still jerseyless, was standing nearby signaling for a fair catch as each ball headed for the returner. I have a feeling this was his own added fillip, as opposed to something the staff asked him to do, although Mike Tomlin and Todd Haley watched this play out without interfering. A beefy guy in a bright red shirt and shoes walked onto the field shortly after warmups were over—I’m pretty sure it was Ladainian Tomlinson, who was at camp for ESPN’s First Take. He spent the whole practice on the field, in various places, and I saw him and Le’Veon Bell in earnest conversation at one point. After the coaches apparently skipped the TE sled drill Wednesday (at least I never noticed it, and it’s hard to miss) it was in evidence early. I’m happy to say that Paul Lang was much improved from last week, although he still got kept after class for one more go, along with the new No. 49, the above-mentioned Jake Phillips. Phillips was OK for the first go, pretty good for the second, and dreadful for the third—I think he was tired. David Johnson was the only one who looked really good. Xavier Grimble wasn’t bad, and his second one was much better. Jesse James is not particularly good. I was noticing today just how lean his arms and legs are. Hopefully he does better in real-life blocking than with the sled. I was curious, and went looking to see how Pro Football Focus had rated him last year. Oddly, they considered him far better of a run blocker than Heath Miller, but not as good as Heath in pass blocking. For what that’s worth. But to return to the non-contested catch drills today, they ran end zone drills, the purpose of which seemed to be to see whether the receiver could reel in the pass and stay in bounds. Quite a few of these were run, and then they split into two groups, with Ben and Eli Rogers, Sammie Coates, Markus Wheaton, Darius Heward-Bey, and of course AB on one side and everyone else on the other. The guys with Ben were running rather more complicated stuff, including drills where they had to do a lot of fancy footwork for the presumed purpose of losing a defender. Then came Seven Shots. Ben to AB beat out the other AB—Artie Burns, twice. If Burns can figure out how to defend Ben-to-AB he will be able to defend just about any other pairing in the league, or that’s what it looks like. One of those Burns was covering extremely well, and Ben just shouldn’t have thrown the pass, but he did, and AB caught it. I’m hoping that Burns will start looking a lot better when he’s covering other guys. After this, there were offensive linemen vs. defensive linemen drills at one end of the field and DBs on receivers at the other end. Although I watched a few of the former, I couldn’t help being drawn in by the WR/DB drills. Artie Burns had an interception and the whole place cheered. But mostly, at least with Ben throwing, the receivers won. And really, wouldn’t we prefer it this way? If the defense, especially the backfield, is still a work in progress, we have to hope that the offense is really as good as we think it is. And my, it does look good. There was a whole passel of officials at practice today (okay, three,) and they were watching intently but only threw a few flags, so that’s good news. 11 on 11s were next, and other than one series Ben didn’t quarterback many of them. I’ll sort of condense these. The series Ben did quarterback was mostly amazing. One perfectly placed pass to Eli was dropped. 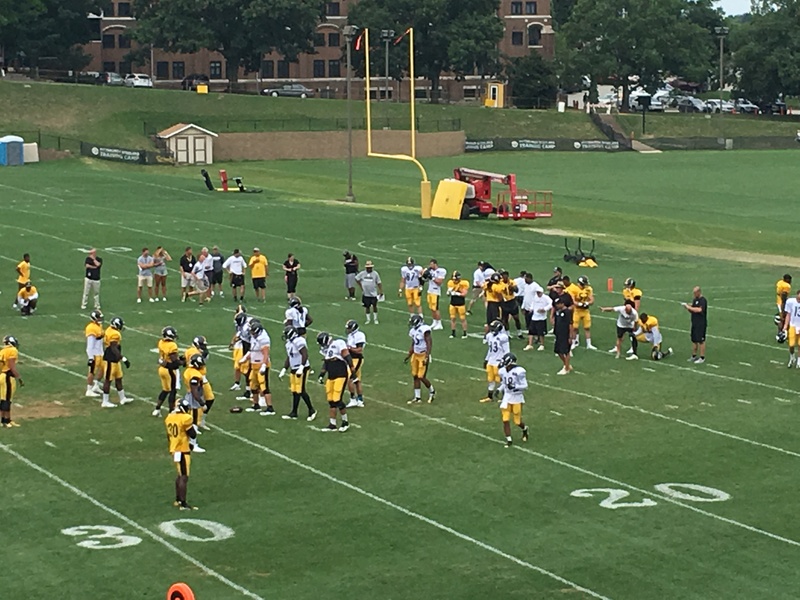 Vince Williams broke up a deep pass to Bell. The sole running play, to DWill, was for no gain. But the rest were things of beauty. A pass to AB would have been a touchdown, despite very good coverage by Mike Mitchell. DHB caught two passes. It was all very satisfactory. The results were more mixed with the other quarterbacks. I noticed the staff taking a very long look at Dustin Vaughan, and it looked to me as if he was making the most of it, with some really impressive passes. Bruce Gradkowski was intercepted by, I believe, Tyler Matakevich. L.J. Fort blew up a play. Ray Vinopal had an interception. There were, however, a number of successful plays. Next came the punting competition, with actual punts. Jordan Berry had some amazing punts. After a slow start Will Monday booted a few pretty good ones. But if I had to choose a punter based on what I saw today, there would be no question that the incumbent stays. The long snapper for all of these, BTW, appeared to be the new guy, Matt Dooley. Finally there were some 11 on 11s focusing on running plays, and the results were interesting. A lot of the plays were blown up. But Daryl Richardson continues to look good. He’s fast when bouncing it to the outside, and pretty good at finding a hole. Bell looked great as usual. Cameron Stingily had his moment. And I wrote earlier in practice “24 is impressing me.” 24 would be Brandon Brown-Dukes. He’s little but tough. He also took a pass from Landry Jones and picked up a lot of YAC. Who else did I notice today? Xavier Grimble looked good and made it through the whole practice again. Ryan Harris was first team left tackle again. Landry Jones continues to look decisive and in control, and to throw it to the correct colored jersey, mostly. The preseason games will tell the tale, but I can see Dustin Vaughan having a chance to win the QB #3 competition. And the previous statement comes with the big caveat that all of this does—none of this tells us for sure what they are going to look like with actual opposing players who actually don’t care if they hurt someone. (I don’t mean in the Vontaze Burfict sense, but just in the usual footbally way.) I realize things will move a lot faster in a real game, even a preseason game. But so far, so good. Your paper towel diary gets better and better. I am jealous as I would love to have the opportunity to go to camp daily. Your observations are incisive and give us vicarious appreciation of attending camp. Thank you. We are in dry dock this summer due to a number of considerations, which is why I’m grateful for your reports and oh so jealous that you are attending regularly. We have attended in other years and will almost certainly get there next year. The fact that we have been to Latrobe a number of times. I know what we’re missing, but your reporting really brings it to life. If you need paper again, try the book store on the backside of the practice fields. I’m sure you could have scored a notebook. I didn’t know there was anything closer than the Walmart that Alameda Ta’amu practically broke his foot walking to. Thanks for the tip! Your training camp diaries are the best I have come across so far this season. For some insane reason, many places seem to be going with a collection of links to tweets from random folks, mistakenly thinking these would make for good reading. They are wrong. Keep doing what you are doing. Like the Steelers, you are the best. I may be wrong. I don’t know if you get stats about how many people read this blog everyday but it is one of the best sites (if not the best) for in depth commentary and analysis available. It is a shame if it isn’t reaching more people. Great diary. See you next Tuesday. I really enjoy reading your diaries Rebecca!